NEW YORK, NY (May 2, 2012) Desiring to continue to enhance support for their community, leaders of the New York City Amateur Radio Emergency Communications Service (NYC-ARECS) participated in the Volunteers Creating Change, the NYC Citizen Corps Council's sixth annual Disaster Volunteer Conference which took place on May 1, 2012 at Pace University in New York City. 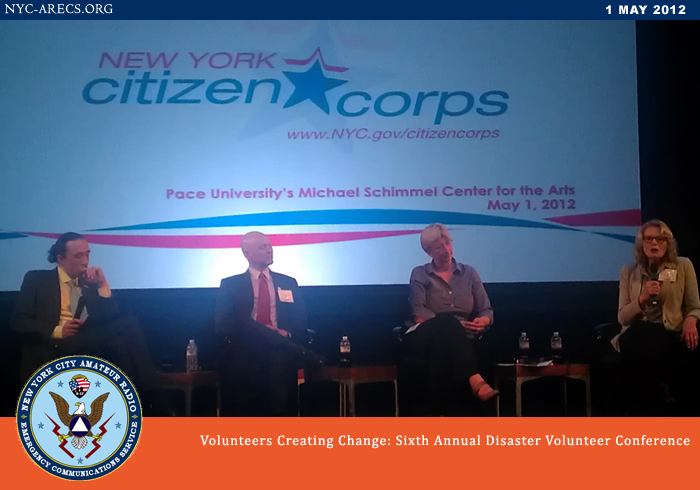 In celebration of the impact New York City's volunteers make, Volunteers Creating Change, discussed how change originates with an idea, and how these ideas often have a tremendous impact before, during, and after an emergency on individuals, families, organizations, and communities. Conference speakers included: The Hon. Joseph F. Bruno, Commissioner of the New York City Office of Emergency Management; Keynote Address by Jeff Parness, Founder and Executive Director of New York Says Thank You Foundation; Gary Bagley, Executive Director of New York Cares; Sara Farmer, Digital Humanitarian; and Pamela Kellner, RN, MPH, Coordinator of Infection Control for the NYC Department of Health and Mental Hygiene. The panel discussion was moderated by Herman Schaffer, MSW, Director of Community Outreach for the NYC OEM. Members of NYC-ARECS have donated many decades of volunteering to their communities across New York City. They follow in the spirit of what Mayor Michael Bloomberg said, "New York has always been fortunate to be home to everyday people who want to pitch in and helpand we need as much help now as ever before." The over-arching mission of NYC-ARECS is to provide professional, timely, quality, and proficient auxiliary radio communications to both government and other organizations which support their communities across the five boroughs. The conference was a collaborative project of the NYC Citizen Corps Council, supported by staff from American Red Cross Greater New York, American Red Cross New York State, Disaster Chaplaincy Service, New York Cares, NYC Department of Health and Mental Hygiene, NYC Office of Emergency Management, The Salvation Army Greater New York Division, and World Cares Center. Persons interested in learning more about how NYC-ARECS can help their community or organization, or persons interested in volunteering, should write to: info@nyc-arecs.org.